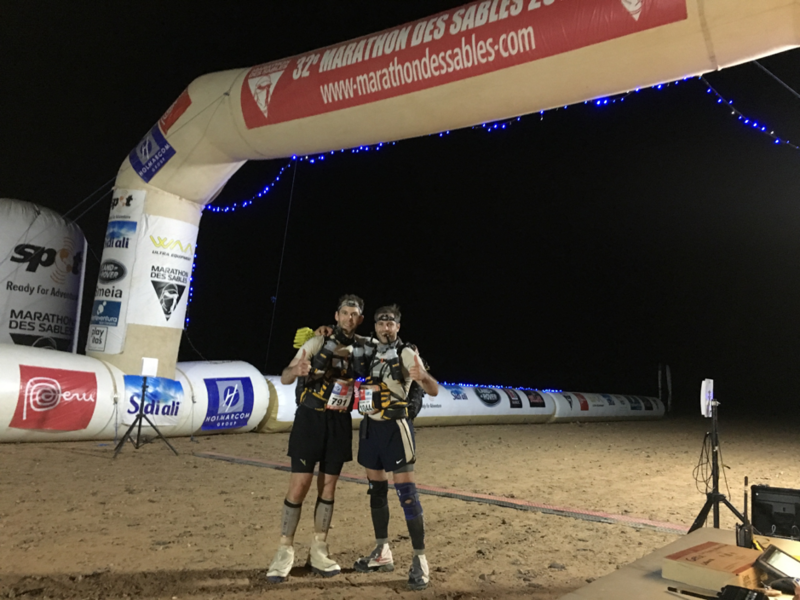 Ben completed the 2017 Marathon de Sables, raising over £5,000 for Universal Chance. It was the 7th April 2017 and I found myself standing in the middle of the Sahara Desert in amongst a crowd of 1,600 other runners wondering how I’d got here. After months of training that included 6 marathons across 4 different countries, my first ultra marathon, months of physio that rebuilt me from not being able to run only three months prior and the sessions in the heat chamber I was at the start line. I remember seeing this race on Transworld sport in the early hours of Saturdays morning as a kid and wondering how people can do such crazy things. 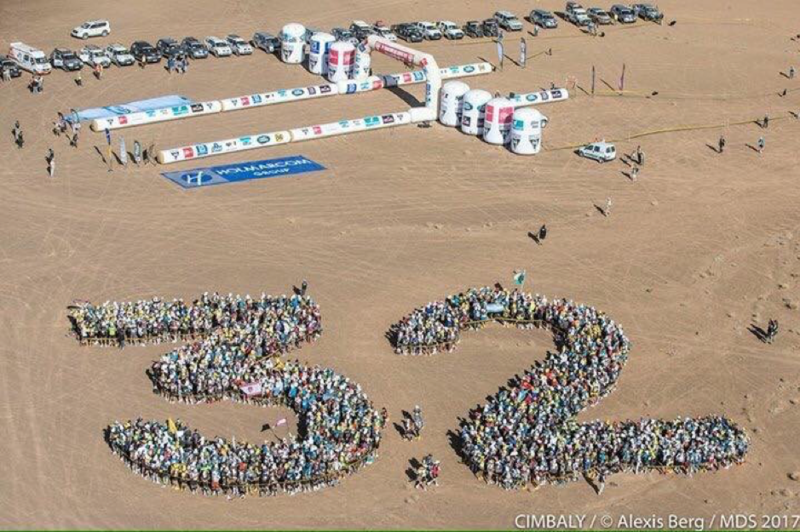 Now I was about to take part in the 32nd Marathon de Sables, billed as the toughest foot race on earth. 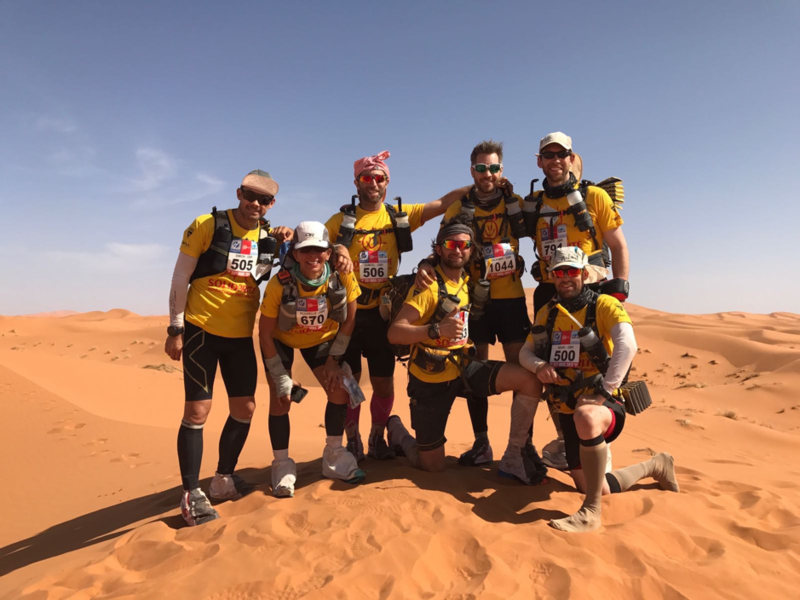 The race is 5 stages set over 6 days in the Sahara Desert, followed by a short but compulsory charity stage on the 7th day. We were going to run around 235km, or approximately 6 marathons in 50-degree heat. To make things more challenging you have to carry everything you need for the entire week with you, food, cooking equipment, any spare clothes, sleeping bag. My pack weighed in at close of 12kg which I was really disappointed at after months of trying to get it as light as possible. I looked around as the famous theme tune to the race ‘Highway to Hell’ blared out over the speakers, participants’ arms raised signing along as the helicopters flew overhead. I felt a mixture of excitement and nerves that were playing havoc with my stomach. I had no idea whether I would be able to finish as thoughts raced through my head of letting all my friends and family down who had sponsored me to raise money for Buhinga Primary School. Then as the music came to an end the countdown started and we were off. 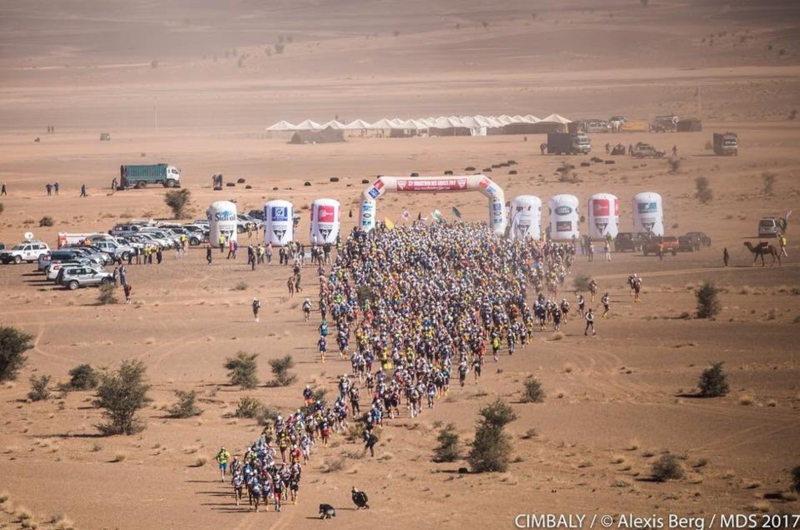 Runners sprawled out across the vastness of the Sahara like a colony of ants. I had my strategy that I’d been planning for months imprinted in my brain and set out at the pace I’d planned. Everyone had flown out of the start and I felt like I was going backwards as I was overtaken by what felt like everyone. The terrain was a mixture of fine sand that shifted under your feet with every step and harder rocky trails. But despite it being tough under foot and the extreme heat I was feeling quite good. By half way I was staring to go past the people, by the end of the stage most people were walking and I was going strong. Right at the end of the stage I caught up with my friend Andy and we crossed the line together. 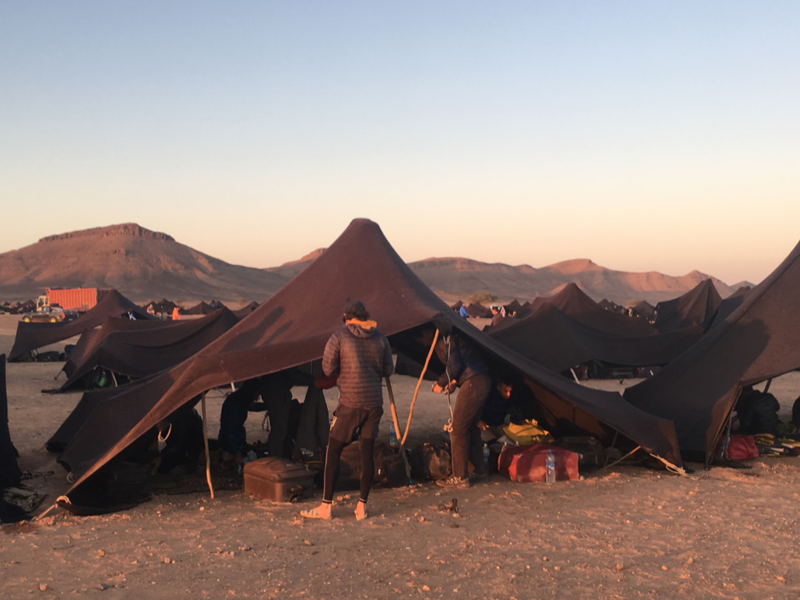 Everyone in our bivouac (tent 106) had a good first day and were pumped to be experiencing the MDS. Day 2 and 3 would however throw up some new challenges that we weren’t expecting. Once again at the start line everyone raced out as if they were doing a park run, something I’d get used to by the end of the week, and it took a lot of restraint to stick with the strategy and not go with them. Andy and I had decided to run together as we were clearly a similar pace and this tactic would turn out to be a massive help through the challenges that were to come. Day 2 and 3 saw our first jebels that are desert mountains making the going really tough. But once you reached the summit the scenery was stunning and unique to anywhere in the world that I’d been before with the vastness of the Sahara reaching out on both sides. We also had a number of stretches of dried river beds running over kilometres of black rubble that acted as a heat trap. My running watch recorded a temperature of 52 degrees and the water rationing and heat were really starting to take their toll. After the third phase I spent the night with severe dehydration with the water supplied not enough to rehydrate me from the run. I had an uncomfortable night not able to sleep through dizziness and the desert sand storm blowing through the bivouac. What got me through the tough times the whole week were the messages of support from everyone back home. You spend the week cut off from the world apart from being able to send 1 email a day home by queuing at the email tent, and then every evening you are presented with a pile of printed emails from people at home. That half an hour each night reading all those messages from all my loved ones was the biggest motivation to grit my teeth and get through this gruelling race. The dreaded long day. The day the scares everyone in camp the most and the day that if you get through you know you can complete the MDS. This year it was over 2 marathons and setting off at 7am Andy and I set ourselves a target of coming home before midnight. After 3 days of running, little sleep and rationed water the ordeal was starting to take its toll. But in a perverse way this was also the day I was looking forward to the most. The first half of the race went relatively smoothly as the previous days had and as we got to checkpoint 6 the sun was setting and we had around 30km still to go. We put on our head torches and knew this was where we were going to have to dig deep. Muscles were aching, fatigue was setting in and the temperature was dropping. Out of nowhere something magical happened. As the sun set on the desert and the stars shone brightly in the sky the landscape came alive with glow sticks marking the route and pin pricks of light from people’s head torches danced in the distance. Both Andy and I seemed to feed off this excitement and the energy from each other and as if from nowhere we got a second wind. We picked up the pace and started passing people running through the darkness getting closer and closer to the end of the stage. We crossed the line in just under 15 hours finishing just before midnight and in the top 200. We were ecstatic and I spent the next 2 hours cheering and applauding people as they crossed the line. After a much needed rest day we were making our way to the start line for the final competitive stage. We still had a marathon to run but everyone was jubilant knowing that now they were in touching distance of completing the 32nd MDS. I was a bit weary not to underestimate a marathon and also strangely emotional walking to the line. It had been tough but also one of the most amazing experiences of my life and I just didn’t want it to end. I was going to miss the desert, my amazing tent mates and everything that was the Marathon des Sables. Andy and I set off together and we really wanted to finish in the top 250, but it was clear from the start that today was going to be a struggle. The week was taking its toll on our bodies and we were both struggling. It felt like we were quite far back in the field and our attention turned to just completing the stage rather than any thoughts of where we might finish. With about 10km to go we were joined by Will, one of our fellow tent mates, and Andy urged me to push on ahead without him to try and finish as high up the filed as possible. My legs didn’t want to move but I left Andy with Will and forced myself to pick up the pace. I gave myself a target of passing 50 people before the finish line and I passed 68. 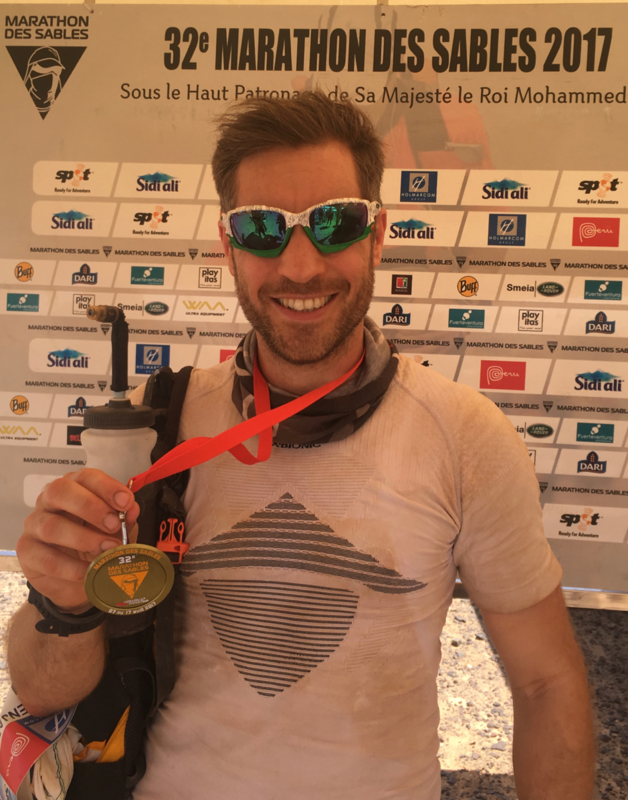 I had done it; I’d completed the Marathon des Sables. I waited to watch Andy and Will cross the finish line and was chuffed that Andy also managed to finish in the top 250 runners in the overall standing. 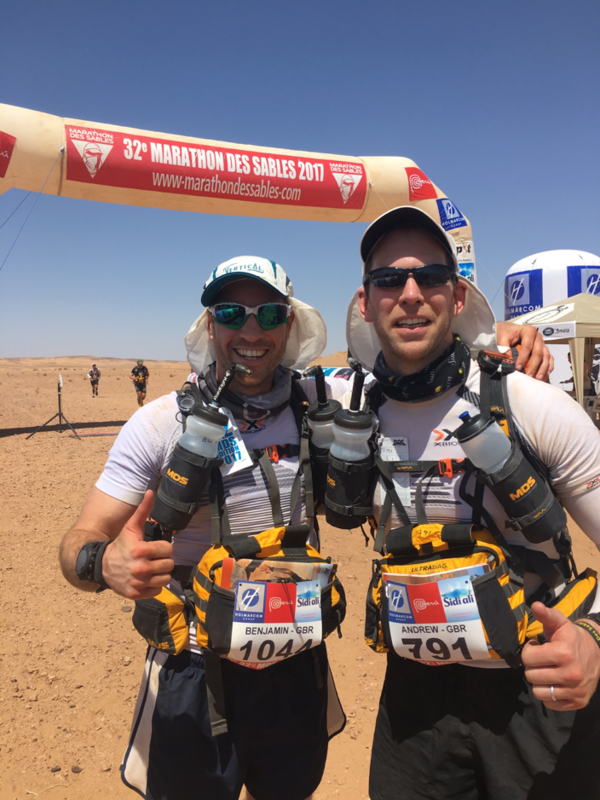 The last stage is a formality but one you must complete to formally finish the MDS. This year it was a short stage and our tent ran the 7km together all wearing the yellow t-shirts that were handed out at the start line. We crossed the line together arm in arm and knelt down to kiss the floor. It was the perfect end to a quite amazing week finishing with these amazing people who I’d shared this experience with.